Celery Facts, an information sheet for kids cooking activities. Celery facts and general information about celery. Grown in the summer. Available in grocery stores throughout the year. Celery grows in the garden like lettuces and cabbages. Add water to a glass and add a few drops of blue food coloring. Stir to combine. Place a celery stalk in the water and let sit for several days. You will see how the celery stalk soaks in water through the stalks by seeing the blue water through the stalk. Choose celery that is light green in color and has moist leaves. Avoid any with limp looking celery. Store in the fridge. You can also cut up stalks and place in a bowl of water. Store in the fridge and they will last longer. Celery has no calories but contains Vitamin A, Vitamin C, iron and calcium. Use leaves for flavor in soups. Cut stalks for salads, soups, add in chicken or tuna salad. 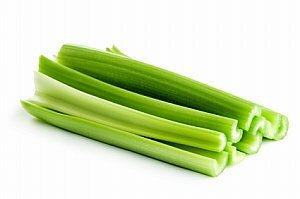 Cut celery into 3-4 inch pieces. Fill middle with cheese spread or peanut butter. 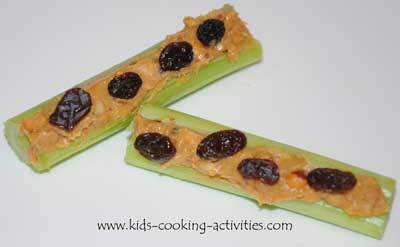 Add raisins to top to get the ants crawling on the log. Heat the oil to hot but not smoking in a large soup pot over medium heat. Place the apples, potato, celery and onion into the hot oil. Stir in the thyme and continue cooking an additional 5 minutes. Pour in the chicken broth and continue cooking 35 minutes. Pour the entire mixture into the blender. Return the mixture to the soup pot. Turn heat to lowest temperature. Sprinkle with the nutmeg and pepper. Continue cooking on low until heated through about 15 minutes. Be careful not to being the soup to a boil or the cheese and cream will curdle. Spread smooth peanut butter over unflavored tortilla wraps and add celery sticks. Roll them up and cover in glad wrap. Enjoy.